Much like Taiji, Japan each year Intuit hunters are issued permits to hunt narwhal, a cousin to the dolphin who has a tusk. Today science has proven how highly intelligent, and social whales and dolphins are. Families stay together for a lifetime, and mothers nurse their babies for approximately the same amount of time as human children. The narwhal tusk is highly sensitive, a tower of nerve endings that sets them apart from all other whales and dolphins. You can see their much coveted tusks sold in shops and exported here. In a recent Narwhal hunt reported in CBC News North the Intuits describe seeing a pod of Narwhal and then running to get their tags. This year, the hamlet applied for hunting tags and got five, which quickly ran out. Neighboring communities chipped in their tags. “Gjoa Haven kindly stepped up because they didn’t have any whales as of yet, and gave us five to use here,” said Panioyak. 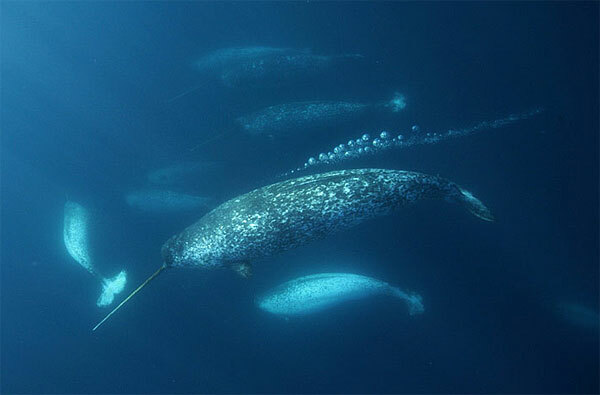 The Narwhals are also threatened by global warming a very serious problem as seen in this recent video. Which is yet another reason to let these amazing beings live in peace.